They at least were the favorites in two informal Breakingviews polls on Tuesday. Fallout from the big lender’s scandals and the athletics brand’s stock-market loser status in 2017 are among the reasons. By investor Nelson Peltz’s criteria, though, both have drawbacks as targets. Breakingviews Global Editor Rob Cox interviews Trian Management founder Nelson Peltz at Reuters Breakingviews' 2018 Predictions event in New York on January 9, 2018. Wells Fargo and Under Armour are among the U.S. companies most likely to attract activist investors, according to two informal polls conducted by Breakingviews on Jan. 9. 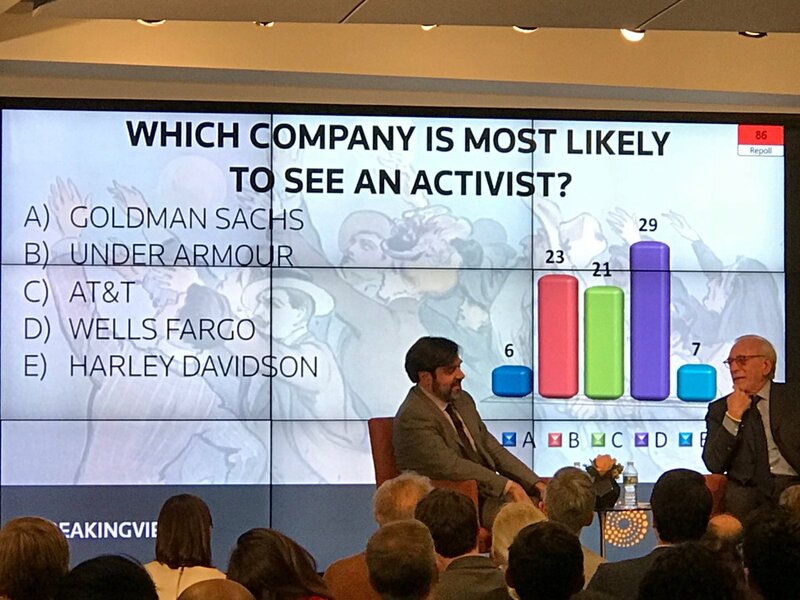 More than 1,000 participants in a Thomson Reuters webcast about Breakingviews’ “Predictions 2018” publication were given the choices of Goldman Sachs, Under Armour, AT&T, Wells Fargo and Harley-Davidson as potential activist targets. Just over 30 percent of the respondents to the survey question chose each of Under Armour and Wells Fargo, with 15 percent or fewer picking the other companies. During a Breakingviews on-stage interview with investor Nelson Peltz later the same day, 29 percent of audience respondents picked Wells Fargo, 23 percent Under Armour and 21 percent AT&T.